SUMMER 2020 HOLIDAYS NOW ON SALE. 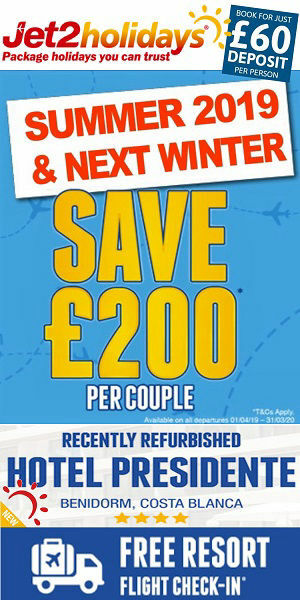 Save up to £100 per person, £200 PER COUPLE! Save £100pp on all Summer 2019 and Winter 19/20 holidays. Valid on any summer or winter package holiday to Benidorm & ALL other destinations for travel completed by 31/03/20. Save 20% on a flight Extras Bundle! Buy 23kg hold luggage, on-board hot meals and pick your seats to save 20% (flight only bookings). Save £100 per person on May June holidays. Book a holiday to Benidorm and with well over 1 million seats available for the 2019 and 2020 seasons, with flights from 9 UK regional airports to Alicante, you will easily find just the right holiday for YOU. Look our for the exclusive FREE RESORT FLIGHT CHECK-IN available at 28 hotels in Benidorm and FREE KIDS PLACES on selected holidays (limited places). ALL package holidays are ATOL proteced and come with 23kg hold luggage, 10kg hand luggage and resort transfers. Fly from: Belfast, Birmingham, East Midllands, Edinburgh, Glasgow, Leeds Bradford, London Stansted and Newcastle. More availability than than ever before with 75 hotels and apartments across Benidorm including the Playa Levante, Playa Poniente, Old Town and Cala Finestrat. Plus Jet2holidays have a customer help center in Benidorm open daily from 9am until 6pm should you need any assistance. BENIDORM PACKAGE HOLIDAYS AND FLIGHTS ARE NOW ON SALE UNTIL 14th NOVEMBER 2020. Something for everyone to enjoy a classic Spanish package holiday in Benidorm. Fantastic total refurbishment the hotel Presidente 4 star superior is back with top service, great food and plush new rooms. Open all year. 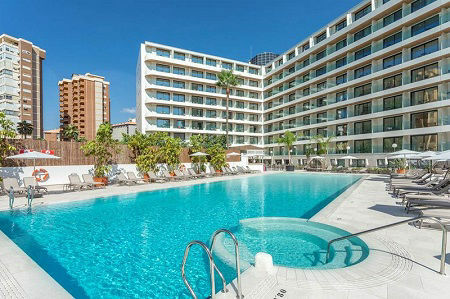 A bit of luxury in the heart of Benidorm a hop from the beach and top cabaret show bars. 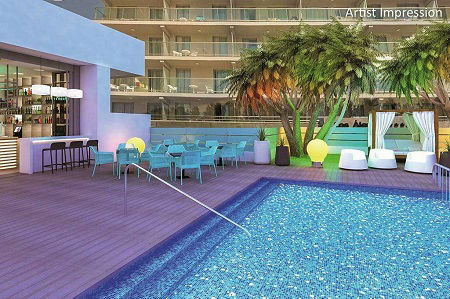 The Hotel Benidorm Centre is getting ready for summer 2019 with a luxury refubishment from top to bottom. Re-opens May 1st 2019, open all year. Super location for the beach, bars, nightlife. The old town is within easy walking distance. THE POOL PARTY HOTEL FOR THOSE WHO PARTY! Adults only aparthotel. Buzzing pool parties day & night with live DJs & GoGO dancers. Ideal for hen, stag parties or groups or mates. Big on value! ALL INCLUSIVE 7 nights from £575. Benidorm holidays for those who like their holidays wild and messy, late and lively! The ideal summer party accommodation. One for the best three star hotels a favourite with Benidorm regulars. Good food, top service, a great location for beach and nightlife. Singles, couples and families will enjoy the Pueblo. Free wifi. 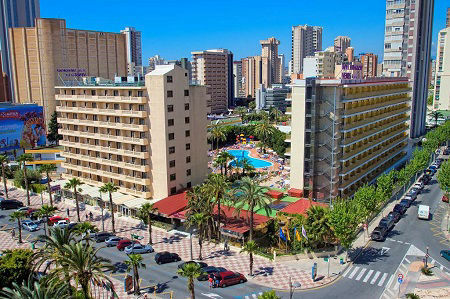 Tip top hotel for fun Levante Benidorm holidays. Open all year with a great sheltered pool. Top winter sun deals for long stay 28 day holidays. 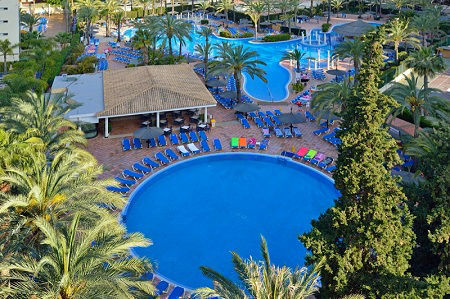 A top hotel for families, singles and couples who enjoy a fun-filled classic Benidorm holiday. Five pools, a swim up bar, 2 buffet restaurants, a kids club and highly rated live shows. Choose B&B, half board, full board or all-inclusive options. Offering great value for money and plenty of action all year round both in the hotel and surrounding area with the best nightlife on the doorstep. The kids will love the splash park. For couples there is a good pool and a spa with sauna/Turkish bath. 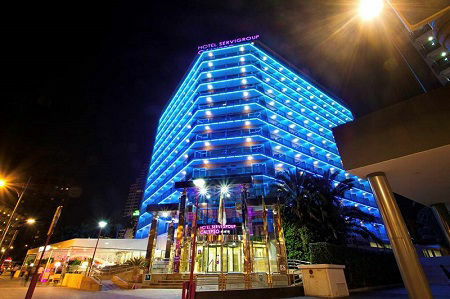 One of the best 3 star hotels in Benidorm. Great food geared up for British tastes and top notch service ensures that many guests return here year after year. A hot spot for lively fun holidays in Benidorm. Enjoy half board or good value full board options. One for the best three star hotels a favourite with Benidorm regulars. Good food, top service, a great location for beach and nightlife. Singles, couples and families will enjoy the Pueblo. Free wifi. 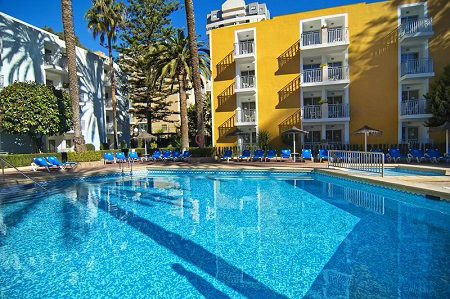 Tip top hotel for fun Levante Benidorm holidays. Open all year with a great sheltered pool. £60 HOLIDAY DEPOSIT - With an ultra low deposit plus a Part Payment Scheme, you can make as many payments as you want and check your outstanding balance. You can even set up a regular Email reminder to make payments when you want. FLIGHT ONLY - Book just a Jet2 flight this includes a 10kg cabin baggage allowance (maximum size of 56cmx45cmx25cm) and online check-in plus a random seat allocated when you check-in. You can add extras like hold-luggage, choose specific seats and buy a pre-ordered tasty meal on all Alicante flights and save up to 20% on an EXTRAS bundle. 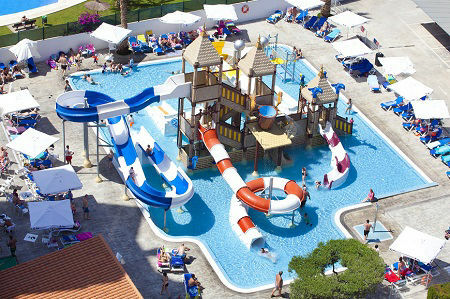 KIDS GO FREE - With more choice for Benidorm Summer 2019 holidays with more FREE child places available at selected hotels, helping to make your money go further on your next Costa Blanca holiday in Spain! Spring 2020 is also now on sale. PACKAGE HOLIDAY - When you buy a Package Holiday this includes 100% ATOL protection for total peace of mind. Also includes your hotel, return flights, airport transfers, 22kg hold luggage plus one piece of cabin baggage up to 10kg (Max: 56cmx45cmx25cm). Plus a 24/7 helpline, in-resort customer helper.